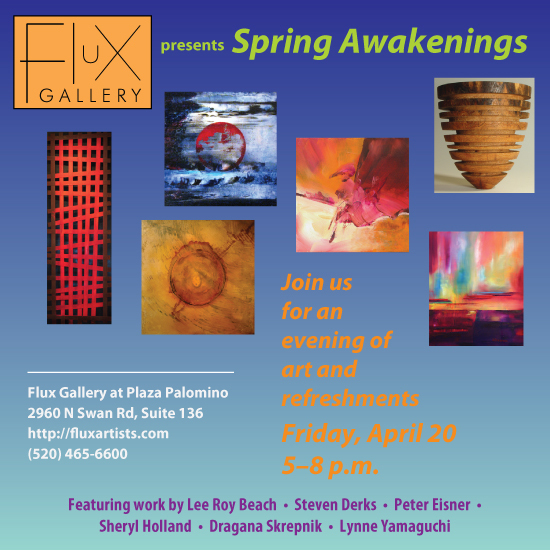 Please join us at Flux Gallery this Friday, April 20, from 5 to 8 p.m. to celebrate spring and to enjoy the art of Tucson artists Lee Roy Beach, Steven Derks, Peter Eisner, Sheryl Holland, Dragana Skrepnik, and Lynne Yamaguchi. This will be our last event in our current space, as we will be moving to a different suite in Plaza Palomino, Suite 100, immediately after. So come join with us in toasting the glorious setting that has been our home for the last two and a half years. Flux Gallery is located at Plaza Palomino, at the southeast corner of Swan and Old Fort Lowell Roads, in Suite 136, across from Dark Star Leather and next to Abstrax Salon. For more information about Flux, please visit http://fluxartists.com.